MANILA, Philippines – EE BOARD EXAM RESULT. 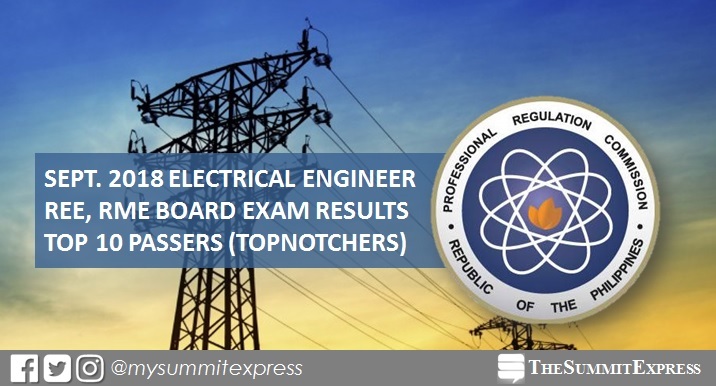 The full list of topnotchers or top 10 passers in the September 2018 Registered Electrical Engineer (REE) and Registered Master Electricians (RME) board exam is available on this page as officially released today, September 6 or in three (3) working days after the exam. The Professional Regulation Commission (PRC) recognizes the highest placers for September 1 and 2 electrical engineer and September 3 master electrician board exam, which were conducted in various testing centers nationwide: Manila, Baguio, Cagayan de Oro, Cebu, Davao, Iloilo, Legaspi, Lucena, Tacloban and Zamboanga. Niño Boy Armario Dacer of Bicol University (BU) - Legazpi aced the REE board exam with 93.05%. Dee-jay Demesa Alvaro of Bicol State College of Applied Sciences and Tech topped the RME board with 92.50%. In the September 2017 REE exams, Edilbert Vallecera Tandaan from Camarines Sur Polytechnic College (CSPC)-Nabua topped the board with 91.80%. It was followed by Ronel del Rosario Mananap of University of Batangas (UB) having 91.70%. Meanwhile, Clint Kenneth Untayao Reducto of Capiz State University (CSU) - Main Campus led the passers for RME with 93.00%. In the September 2016 REE exam, Alfred Isaac Rondina Ajo of Cebu Institute of Technology (CIT) aced the board with 92.40%. It was followed by William Micua Noces of Pangasinan State University (PSU) with 91.10%. For the RME exams, Aidan Destacamento Encarnacion of Sorsogon State College - Sorsogon, Judy Ann Perez Montecillo of Laguna State Polytechnic University (LSPC) - San Pablo and Alexander Tumbaga Zurbito Jr. of Bicol University (BU) - Legazpi tied on highest place with 93.00%.